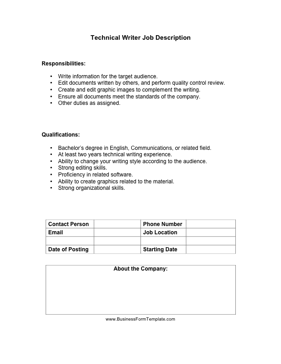 This job description outlines the basic responsibilities, duties and qualification requirements when hiring a technical writer. Write information for the target audience. Edit documents written by others, and perform quality control review. Create and edit graphic images to complement the writing. Ensure all documents meet the standards of the company. Bachelor's degree in English, Communications, or related field. At least two years technical writing experience. Ability to change your writing style according to the audience. Ability to create graphics related to the material.